'Four' is the name of Cupola:Ward's wonderful new EP. 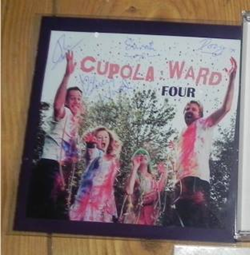 Both the name of the band and the name of the EP are pretty self explanatory, however, in case you are unaware, Cupola:Ward is made up of the wonderful band Cupola (which brings together the brilliant musicians Sarah Matthews, Doug Eunson and Oli Matthews) and the talented, young folk singer Lucy Ward. 'Four' contains four songs, created by four musicians, so it is a pretty practical name. The EP opens with the song 'Cotton Mills at Cromford'. It was that was written in 1778 for an annual street party for the workers at Richard Arkwright's mill (according to the sleeve notes) and celebrates the positive aspects of working in a mill. Ironically, the words are set to the tune of 'Hard times (of old England)' which is an incredibly famous song that details how gloomy life is for tradesmen. Cupola:Ward have created there own wonderful arrangement for this song that creates a joyous atmosphere which is really fitting for the image the words portray. 'The Bone Lace Weaver' follows 'Cotton Mills at Cromford' and has a far more reflective, solemn tone. It is about the way of life for 'Bone Lace Weavers' and is said to be written by Leonard Wheatcroft, of Derbyshire, in the 17th century. Wheatcroft seems to be an interesting character who seems to have been a tailor, parish clerk, orchard planter, and soldier during the Civil War. Furthermore, it appears he was not a wealthy man as he was imprisoned three times for debt. He wrote various famous poems and may have been inspired to write this due the apprenticeship of his daughter to a bone lace weaver. The song is set to Roy Harris' tune. It is mostly sung by Lucy. I love the use of percussion on this track as well as the instrumentation which really bring out the beautiful melody. 'When God Dips his Pen of Love in my Heart' has an incredibly different feel to it compared to the other songs. It is a bluegrass hymnal with a very upbeat tune and was written by Alison Krauss. It is beautifully sung and arranged by Cupola:Ward. 'King of Rome' is the final song and contains the most extraordinary story. It includes some amazing four part vocal harmonies. The song was written by Dave Sudbury. It has no musical accompaniment which really focuses the listeners attention on the wonderful story about someone who keeps. It is a truly beautiful song. Furthermore, I recently saw Cupola:Ward live at Gower Folk Festival, and they were the most amazingly energetic performance I have ever seen. I really recommend going and seeing Cupola:Ward live as well as buying this new EP and I am sure in the future we will hear a lot more about them.